How do you make a fabulous dining experience filled with great food and conversation even better? 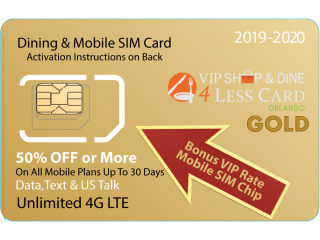 Save with the amazing Orlando VIP Shop & Dine 4 Less Card GOLD! Dine out more and spend less in Orlando with the Orlando VIP Shop & Dine 4 Less Card! For one low price, up to four persons receive exclusive discounts at over 150 top Orlando restaurants as well as deals at a number of Orlando’s best shopping venues. You only need to use the card once or twice and you will more than recoup the cost of the card, but the more times you use it the more you save! Each Orlando VIP Dine 4 Less Card presented is valid for up to four paying guests. If you have more than 4 persons in your party additional cards must be purchased. The Orlando VIP Dine 4 Less Card is not combinable with any other discounts or promotions. Alcohol, beverages, tax and gratuity may not be subject to discounts and will be determined and maintained solely by the participating restaurant. Complimentary Destination Savings Passport .